Yesh Atid, Zionist Union, and Meretz demand vote to dissolve government, hold early elections. 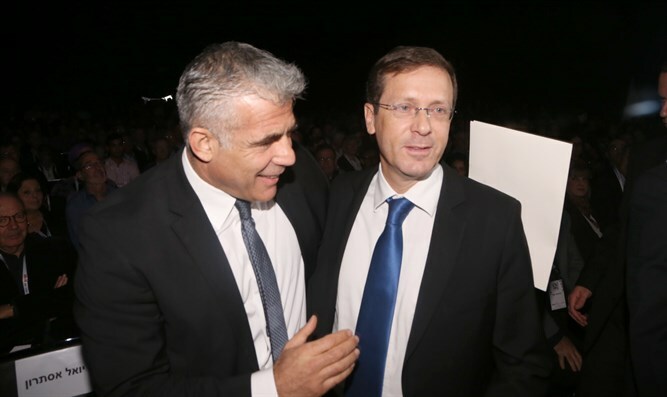 Opposition parties Yesh Atid and Meretz requested a vote this week to dissolve the current government and force early elections. The request was submitted to Knesset Speaker Yuli Edelstein after the Zionist Union was prevented from submitting a bill to dissolve the Knesset earlier Monday by a protocol which prohibits the holding of a first vote on a new bill in the final week of a Knesset session. Yesh Atid and Meretz requested that the vote for dissolution be granted the same exception which was granted for the haredi draft bill Monday. "The prime minister, who dragged the political system into a spin only to avoid his legal troubles, continues his baseless claims, including the statement that the opposition is afraid of elections," MK Ofer Shelah, chairman of the Yesh Atid Knesset faction, said after the letter was submitted to the Knesset speaker. "The citizens of the state [need us to hold] elections as soon as possible, in order to replace the current government with those who would act in the best interests of the state, and not out of his attempts to extricate himself from an indictment." Polls show that 51% of the voting public does not want elections at this time.